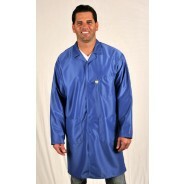 Tech Wear Traditional ESD-Safe 40"L Coat IVX-400 Color: Royal Blue Size: 2X-Large. Tech Wear Traditional ESD-Safe 40"L Coat IVX-400 Color: Royal Blue Size: 3X-Large. Tech Wear Traditional ESD-Safe 40"L Coat IVX-400 Color: Royal Blue Size: 4X-Large. Tech Wear Traditional ESD-Safe 40"L Coat IVX-400 Color: Royal Blue Size: 5X-Large. Tech Wear Traditional ESD-Safe 38"L Coat IVX-400 Color: Royal Blue Size: Medium. Tech Wear Traditional ESD-Safe 37"L Coat IVX-400 Color: Royal Blue Size: Small. Tech Wear Traditional ESD-Safe 40"L Coat IVX-400 Color: Royal Blue Size: X-Large. Tech Wear Traditional ESD-Safe 34"L Coat IVX-400 Color: Royal Blue Size: X-Small. 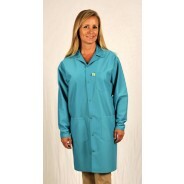 Tech Wear Traditional ESD-Safe 40"L Coat IVX-400 Color: Teal Size: 2X-Large. Tech Wear Traditional ESD-Safe 40"L Coat IVX-400 Color: Teal Size: 3X-Large. Tech Wear Traditional ESD-Safe 40"L Coat IVX-400 Color: Teal Size: 4X-Large. Tech Wear Traditional ESD-Safe 40"L Coat IVX-400 Color: Teal Size: 5X-Large. Tech Wear Traditional ESD-Safe 38"L Coat IVX-400 Color: Teal Size: Medium. Tech Wear Traditional ESD-Safe 40"L Coat IVX-400 Color: Teal Size: X-Large. Tech Wear Traditional ESD-Safe 34"L Coat IVX-400 Color: Teal Size: X-Small.